Since I’m just a few days away from seeing my first movie on this list, I need to post it before it’s too late! Please note that even though the list skews towards big, flashy action movies, I still really enjoy smaller, more intimate films. I may not get as excited about them in advance, but there’s a very good chance there are movies not on this list that will end up on my favorites list for 2019. I’m particularly looking for some great Netflix rom coms. 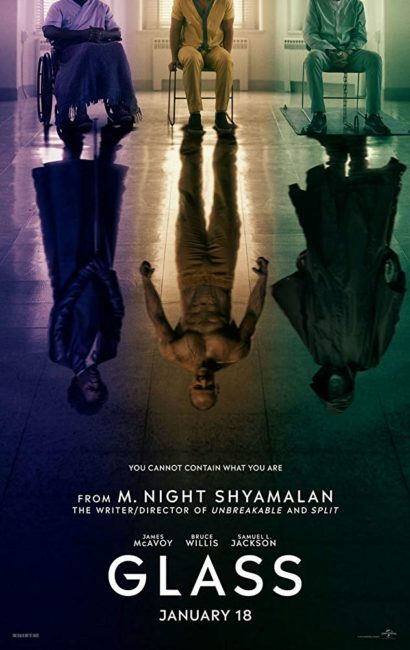 Glass (January): I loved Unbreakable, and I enjoyed Split quite a bit too. Even though reviews are mixed on Glass, I still want to see it. How to Train Your Dragon: The Hidden World (February): I really loved the first movie, as dragons are awesome, especially if they kind of act like cats. The early reviews of this are glowing. Captain Marvel (March): After Wonder Woman, I realized I want more super hero movies led by women. Plus, I love that Marvel has scheduled this so close to Avengers: Endgame, as it seems to indicate the two are closely tied to each other. Us (March): I really enjoyed Get Out, and I wish I had seen it in the theater. I won’t make the same mistake with Jordan Peele’s next movie. Avengers: Endgame (April): Yes. Please. I must watch this movie! Godzilla: King of the Monsters (May): This has one of the best teasers of any movie I’ve ever seen. I love Godzilla as a good guy, and I think this is going to be quite the spectacle. Toy Story 4 (June): While I would prefer for this to be an original Pixar film, I trust that they had a reason for making it (a story-driven reason). Spider Man: Far from Home (July): I know nothing about this movie other than that I really want to see it and that Spider-Man is probably in it. It: Chapter 2 (September): This was the biggest surprise for me, and it’s possible it shouldn’t be on the list, as I might be too scared to actually see it. Plus, it won’t have kids-on-bikes vibe I loved so much about Chapter 1. But I still kind of want to see it in the theater, if not just to be a part of the cultural experience. Star Wars Episode IX (December): Please be awesome. Please, please be awesome. Trust you I do, JJ Abrams. What are a few movies you’re eagerly anticipating in 2019? This entry was posted on Wednesday, January 16th, 2019 at 11:07 pm	and is filed under movies. You can follow any responses to this entry through the RSS 2.0 feed. I’m looking forward to most of yours too especially, Avengers: Endgame, Captain Marvel, Star Wars 9, Spider-Man, Aladdin, Men in Black International, Jumanji 2. Plus a couple you didn’t mention, Joker, Kingsman 3 and Hellboy and maybe the Terminator one too. It’s alot of sequels, but I guess we look forward to these as we know what to expect. Us looks terrifying (in a good way)… I’m surprised you’re going to give it a try in the theaters! Definitely looking forward to see How to Train Your Dragon 3, Frozen 2, and Toy Story 4 with my daughter and probably Lion King and Aladdin. So many sequels/remakes! As for myself, I’m anticipating Serenity, Greyhound, Pet Sematary, The Curse of La Llorona, Ad Astra, Flarsky, Once Upon a Time in Hollywood, Gemini Man, The Goldfinch, and The Irishman. Those are a lot of sequels and remakes! It looks like a good year for family movies. I missed the Irishman, but I’m very much looking forward to it too. Despite all the good movies, i forgot to mention that the one thing I would want to see in theaters more than anything is the Game of Thrones finale. Since this season’s episodes are rumored to all be feature-length, I think it would be awesome to watch the series’ conclusion on the big screen. Probably only wishful thinking though. Oh wow, I didn’t even know the next chapter to IT was coming this year. Excellent. I’m also a fan of Unbreakable so very interested to see Glass. I’m so excited about Us I can’t even tell you. Brightburn looks very cool and Velvet Chainsaw on Netflix. I’m also curious to see if the new series of The Punisher is as brilliant as the first, but TV shows is a different topic! 😀 What I’ve found recently is the movies, shows and documentaries I’ve really enjoyed and been excited about have just appeared, or been announced shortly before they air. Most of my favourites last year were on Shudder and Netflix and took me by surprise. I like that! I forgot about Brightburn! I’m very curious about that after seeing the trailer.